Annual inflation hits double digits …. Inflation in Zambia has soared to double digits and the local currency, the kwacha, has depreciated against major foreign currencies, and analysts have blamed President Levy Mwanawasa’s continued ill-health for the changes. Mwanawasa is currently hospitalised in a French military hospital in Paris, where he was flown to on July 2 after suffering his second stroke on June 29, the eve of the African Union (AU) summit in Egypt. In a statement made to parliament last week, Health Minister Dr Brian Chituwo who recently visited the President, said that although Mwanawasa was in a stable condition, he remained heavily sedated and his healing would take long. “Saying Mwanawasa’s illness has not had any impact on the economy is denying to accept reality. Everyone is nervous. I am not only talking about the citizens of this country but investors as well. For them, it has now became a wait and see situation before they can pour in their investments into this country,” said an economist who preferred anonymity. Since Mwanawasa’s stroke, Zambia’s inflation has risen to 12.6 percent, up by 0.5 percentage points from June, according to the Central Statistical Office. In addition, the kwacha, which was trading at 3,100 to US$1 before Mwanawasa’s illness, has depreciated to around 3,600 per US$1. While there are arguments that Zambia’s inflation rate started its upward move early this year when fuel prices hit record highs, analysts maintain that Mwanawasa’s health has played a major factor. Despite the rising inflation, government has insisted that the ambitious target to attain a 7 percent annual economic growth and reduce inflation to the same percentage is achievable. Bank of Zambia governor, Caleb Fundanga said although it was expected of people to hold onto their money and to stockpile foreign currencies in present circumstances, government had US$2 billion in reserves to sell in the market if a shortage of foreign currency occurred. Fundanga said nothing would change in the absence of Mwanawasa because government had already set-up systems that guaranteed investor confidence and could not derail economic growth or chase away investors. LUSAKA (Reuters) – Zambia has enough currency reserves to protect the economy in case the illness of President Levy Mwanawasa prompts some reduction in foreign investment, central bank Governor Caleb Fundanga said on Tuesday. Fundanga said the only slight worry of the Bank of Zambia (BoZ) was rising oil and food prices, which threatened its single digit inflation target. However, he remained optimistic of achieving 7.0 percent annual inflation in December this year. Fundanga said it was evident the illness of Mwanawasa, who is in a French hospital after suffering a second stroke, had caused anxiety among some investors but that there was “no need for panic”. “The investors in the mines will continue exporting copper. It is possible that … some investors may decide to pull out, but we have enough reserves, $1.4 billion held by the Bank of Zambia and another $1 billion by commercial banks,” Fundanga told a news conference, adding Zambia had 5.6 months of import cover. Mwanawasa impressed the International Monetary Fund and other Western donors by cracking down on government spending and launching an anti-corruption drive. Fundanga said Zambia had investment pledges totalling $1.8 billion so far this year compared with just $1 billion in the first six months of 2007. The government has previously said a number of these investments have been fulfilled. “Naturally, as a result of the illness of the captain, as some refer to the president, there are some people who might be feeling uncomfortable. Given this situation, are we vulnerable? Will all forex (foreign exchange) dry up? The answer is ‘no’,” Fundanga added. He said mining and non-traditional sectors had continued to perform satisfactorily with copper export earnings for the three months to June just 0.1 percent lower than the previous quarter’s earnings, at $967.6 million. Fundanga said non-traditional exports at $187.6 million at end-June were 12.3 percent above the $167.1 million recorded in the previous quarter ending in March. “Favourable export earnings have led to the strengthening of the external sector reflected in the appreciation of the kwacha against major currencies and a 10 percent increase in international reserves to $1,338.4 billion in June 2008 from $1,216.3 billion in March 2008,” he said. There were inflationary pressures from a 15 percent wage increase for civil servants from January and from higher global oil prices, which would put pressure on transport and commodity prices. “However, these pressures may be mitigated by pass-through effects of the appreciation of the exchange rate of the (Zambian) kwacha against major currencies on account of external sector performance,” Fundanga said. Fundanga said the kwacha appreciated 11.3 percent against the dollar in the three months to June to trade at an average of 3,259/dollar. “We cannot give up on 7.0 percent inflation at the end of the year because we have enough food to feed ourselves and we will not necessarily be affected by global food prices,” he added. This week ‘s memo is about the next Zambian president. Who should take the Zambian presidential sit in 2011? I hate to admit this, the truth is, our leaders are always voted by villagers, marketeers and street boys who have no clue about education and foreign policies. According to our observation, most politicians have a way to get into a mind of a person with little knowledge or no knowledge at all. This includes developed countries. If you take a close look on politics, you will find that people end up voting for a candidates who keeps preaching what voters want to hear. People will go out to vote just because of a hear say, without assessing a candidate in practical terms. In most cases, political Candidates have a tendency to study what the audience want to hear. Any one can stand and say I will give you jobs, bring rich breakfast, lunch and dinner in your home. Zambian Voters will listen because there are no jobs and are in poverty. As a candidate, you are happy when people vote for you. Are you going to keep your promise once you are voted in office? Practically, things always turns out to be different from all the promises that politicians make. it’s time for candidates who are aspiring, to start preaching on practical issues and not to give fake hopes to people. Talk about real things that affects the economy of every country, and explain, to voters that it is not an easy path to bring stability to the country, it takes hard work and devotion to make things happen. Disappointments, comes out when a candidate makes fake promises, do something else after being voted into office. We ask all the aspiring candidates to be more practical in the way they make promises to people, to avoid early disappointments. It is not fair for voters who have no clue on “Inflation” or economics, who listens innocently and line up to vote for a candidate who later does something contrary to his/her promise. Zambia has highly experienced ,knowledgeable, and educated people. Why is it that Zambians ends up voting for wrong leaders? Could it be that all the educated Zambians, are too frustrated with the system, and has opted to sit back and watch, while the poor Zambian villagers , marketeers and street boys take their stand to vote for what they hear from those who can read their minds and give them fake promises? or could it be that qualified leaders and educated Zambians are too busy with other duties and other personal stuff, or they are not brave enough to fight for their people or is it lack of bringing themselves out with a positive approach to their fellow Zambians? If you are candidate or a voter. It is time to revisit your weaknesses and try to improve on them. Avoid: Hate, tribal, gossip, and malicious rumors. By all means, should not be used as a tool to pick a right candidate for president. Validate each rumor, use your own discretion and common sense. Avoid operating like robots that are programed to perform certain functions. Operating like a robot, makes both leaders and their voters look like idiots, when things go sour. Not every rumor or gossip is true. Yes there is no smoke without fire, but you have to remember that humans always enjoy negatives that appear on a candidate without using their good sense of judgement or common sense, they vote basing on those facts. 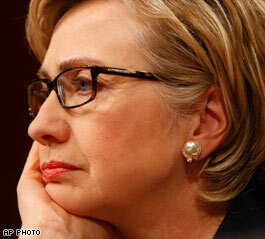 If a negative outweighs a positive side of a candidate, it takes away all the good work he/she has done. Remember, Media and campaigns are there to help voters to pick the best candidate, but at the same time, uses that as a tool to bring down a candidate, if the opponent has strong links to the media. Many great leaders are brought down in no seconds, and voters end up voting for useless candidates. Again… use your common sense and your good judgement, when you read negatives that comes flying on potential candidates. On that note, we decided to re-visit Inonge Mbikusita Lewanika’s profile, as she seem to be carrying all the package of what makes a great president. 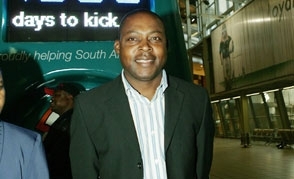 We at Zambian Chronicle, would like to see Dr Inonge Mbikusita Lewanika, contest for president in 2011. We have well rounded Zambian candidates like, HH and Many more, Inonge adds to the package. For years, Zambians have had a problem when it comes to picking a president. It’s time to check where Zambians go wrong when it comes to voting? We Vote with emotions, tribal, rumors and hate, Worse more when it comes to gender. In the end we get disappointed with our own voting when things go in a different direction. May be it is time to turn around, and look seriously inside lives and works of the aspiring candidates, without looking at a tribe, relations, cheap gossips or malicious rumors. It is even more difficult to convince a Zambian mind, when it comes to women leadership. When we look at Zambians, we see a lot of potential candidates men and women, that can lead us in 2011, and bring light to Zambia. I am not here advocating for Inonge because I am a woman. Here at Zambian Chronicle, we are looking at the credentials, Education and experience. Zambia needs a candidate for president, that has both local and foreign policy experience. As an African country we can not rule out education. It should be very cardinal in this aspect. Therefore when it comes to choosing a president, let us open our eyes and pick quality and not quantity. Inonge Mbikusita Lewanika and Hakainde Hichilema are both quality. Having said that, Zambian Chronicles will continue to bring out candidates, that we think can make great president for Zambia in the future. As we pointed out, in our earlier debates, Hakainde Hichilema and Inonge Mbikusita Lewanika, have the real package. Therefore, without looking at the tribes and gender, we feel Inonge can make a great president for Zambia for 2011. This includes, the appointees of ministers and local government officials. This forum may help the next Zambian President to pick right candidates for certain roles. 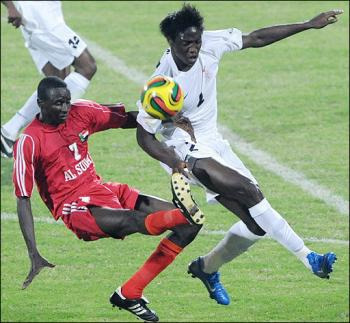 Copyrights © 2008 Zambian Chronicle. All rights reserved. Zambian Chronicle content may not be stored except for personal, non-commercial use. Republication and redissemination of Zambian Chronicle content is expressly prohibited without the prior written consent of Zambian Chronicle. Zambian Chronicle shall not be liable for any errors, omissions, interruptions or delays in connection with the Zambian Chronicle content or from any damages arising therefrom. 1. Dr. Inonge Mbikusita-Lewanika is currently Ambassador of the Republic of Zambia to the United States of America . Before her appointment to Washington D.C.
2. She was Ambassador and Special Envoy to the Zambian President during his term as Chairman of the African Union. 3. 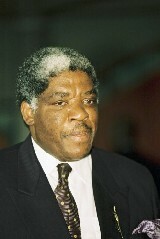 Dr. Lewanika served as a Member of Parliament in the Zambian Parliament from 1991 to 2001. 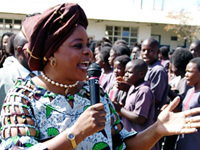 She was the first Chairperson of the Zambia All Party Women Parliamentarians Caucus and also founding Vice-chairperson of the outhern, Eastern and Horn of Africa African Women Parliamentarian Caucus. 4. At a very critical time just before national elections in 2001, Dr. Lewanika chaired the National Crisis Committee of the Alliance of Opposition Political Parties. 5. 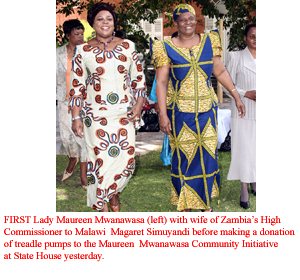 She is a former candidate for President of the Republic of Zambia in the December 2001 Elections. 6. She is an Educator by profession and has worked in various levels of Education. Prior to her involvement in politics, Dr. Lewanika worked with UNICEF in key leadership roles in Africa overseeing more than twenty countries at a time. Jim Grant, the former head of UNICEF once called her “the most knowledgeable person about the children of Africa .” Dr. Lewanika was among five women from various continents to brief members of the United Nations Security Council on the first and unprecedented debate that resulted in UN Resolution 13 on WOMEN, PEACE and SECURITY in the year 2000. She was among sixteen (16) eminent African Women Members of the Organization of African Unity (now African Union) Committee on Peace and Development, an Advisory Group to the African Union. Academicians, Researchers and Members of Civil Society to the Zimbabwean Presidential, Mayoral and Council Elections in 2002. 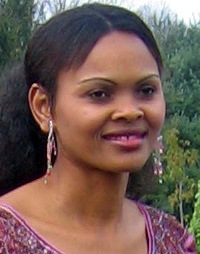 She was one of the International Youth Foundation’s founding board members. Dr. Lewanika holds a Ph.D. in Early Childhood and Primary Education from New York University . She is a mother of two grown daughters, a grandmother to four boys and a grand daughter. She has lived in five countries and speaks eight languages. After 30 years of promoting girls’ education in the less-developed world, aid workers are now realizing that it is not enough to simply open the school door to girls. Unemployment, clean water and HIV/AIDS are now also on their agenda. WASHINGTON (WOMENSENEWS)–Like many aid workers and activists trying to improve the lives of women in developing countries, Inonge Mbikusita-Lewanika has long viewed education as the key to solving many of her countrywomen’s problems.Mbikusita-Lewanika, a former member of Zambia’s parliament and now the country’s ambassador to the United States, says the benefits of educating girls are so numerous– from raising marrying ages and lowering birth rates to stemming health and economic problems–that she would like to install a plaque reading “Send the Girls to School” in every village.But 30 years after the U.S. government and other aid-givers began to promote gender equality in their programs, they, like Mbikusita-Lewanika, have learned that relieving the burdens of poor women is more complex than once thought. Foreign aid officials from the United States, United Kingdom, United Nations and various nongovernmental organizations say that it is not enough to open the school door to girls if their families are besieged by unemployment, unclean water, labor-intensive household chores and, increasingly, debilitating health problems such as HIV/AIDS. Nor is it enough to get a few women elected to the parliament or congress while women in the countryside still suffer age-old discriminations.To succeed, say aid experts, gender-equality programs must be integrally incorporated into the aid process from top to bottom, beginning with constant attention to gender issues at the policy level and ending with a wide distribution of burden-relieving aid in the rural areas where discrimination is often most ingrained.In Africa, for instance, women perform about 75 percent of agricultural work, according to Mark Blackden, the lead economist in the World Bank’s Poverty Reduction and Management of Gender Equity Division. He estimates the continent’s per-capita income would have doubled over the last 30 years if women had been given more aid and education to help with crop production. But aid givers have only recently realized that “one does indeed need to talk about the African farmer and her husband,” Blackden said.Instead, because of cultural misunderstandings, they have often directed agricultural education and technology to men. As a result, Mbikusita-Lewanika said, it is not uncommon to see men sitting on tractors as women and girls continue to cultivate with a hand hoe nearby.Clearing a small plot of land in this manner can involve 18-hour days, leaving women little time to raise their children, gather fire wood, walk long distances to find potable water and, increasingly, care for the sick. With such intensive household labor needs, Mbikusita-Lewanika said girls often have little time for school.”The average woman takes care of everyone else but herself,” Mbikusita-Lewanika said at a recent Capitol Hill briefing for legislative staff.In countries where economies have been destroyed by conflict or AIDS, another factor diminishes the rationale for education: The lack of jobs when a girl graduates. As a result, Mbikusita-Lewanika said that, while education “may be the most important investment, it may not necessarily be the first investment” that donors should undertake. For instance, providing drinking water would save women in many Zambian villages 1 1/2 hours a day, she said.In 1973, the U.S. Congress passed the Percy Amendment requiring that the nation’s foreign aid help integrate women into the mainstream of developing countries’ societies. Since then, the U.S. Agency for International Development–the main administrator of U.S. development aid–and other organizations have progressed from conducting a few gender equality projects a year to considering gender issues as a part of nearly every decision. While women’s issues once were often segregated in a separate office or set of discussions, all programs are now expected to address their impact on women.”The progress can be summed up in one sentence: It is no longer a separate thing,” USAID administrator Andrew S. Natsios told a Washington foreign aid conference earlier this month. Other officials suggest increasing funding to fight HIV/AIDS in Africa. The $2 billion the Bush administration is prepared to spend in 2004 “is not enough,” said Kathryn Wolford, president of Lutheran World Relief, based in Baltimore. At the foreign aid conference, Phil Evans, the senior social development adviser for the United Kingdom’s U.N. mission, said that statistical gender analyses are often riddled with “methodological problems,” in large part because researchers have focused on studying women instead of placing them in a societal context. Ratifying the treaty would send a powerful signal that the United States will join the world to “use the instruments available to us to hold countries accountable” for improving women’s lives, Geeta Rao Gupta, president of the Washington-based International Center for Research on Women, told legislative staff. “It has taken a very long time to get as far as we are and (we) have a very long road to go,” said Julia Taft, assistant administrator and director of the United Nation’s Bureau for Crisis Prevention and Recovery. ABOUT 500 workers at Chambishi Copper Smelter (CCS) have been issued with summary dismissal letters following their two-day riotous behaviour in protest against alleged poor conditions of service. And Police have apprehended seven CCS workers in relation to the riot that took place on Tuesday at the copper smelter company.Both CCS company secretary, Sun Chuanqi, and Copperbelt permanent secretary, Jennifer Musonda, confirmed the figure of the dismissed workers in separate interviews yesterday. Mr Chuanqi revealed that company property worth about US$200,000 was allegedly destroyed by the irate workers during the riot.He said management was saddened that the workers rioted before the conclusion of negotiations with union representatives. Mr Chuanqi said the workers had been given a grace period of three days within which to exculpate themselves and show cause why disciplinary action should not be taken against them. He complained that work had been adversely affected by the workers’ riotous behaviour. Mr Chuanqi warned that all workers identified as ring leaders would be dismissed from employment to discourage others from behaving in a similar manner. By press time yesterday more than 19 alleged ring leaders had been identified while more than 66 workers collected their summary dismissal letters. Mr Chuanqi appealed to workers to exculpate themselves within the stipulated time so that the innocent ones could be reinstated. “We’re appealing to the workers to respond quickly to the summary dismissal letters so that those that did not take part in the riotous behaviour could be reinstated because work has been grossly affected and we need local manpower,” he said. Mr Chuanqi said CCS belonged to Zambians and wondered why the workers destroyed what belonged to them simply because of a dispute that could have been resolved amicably. “What we are building here also belongs to Zambians, so people must desist from destroying this investment. For those who will not come to collect their letters, we will follow them until they get them so that they can exculpate themselves,” he said. However, Mr Chuanqi paid tribute to government for its continued support to Chinese investment in Zambia. He also said the Chinese worker only identified as a Mr Li who was injured during the riot on Tuesday was discharged from the hospital. And Mrs Musonda also confirmed that workers were served with summary dismissal letters when they reported for work yesterday. A check by the Zambia Daily Mail crew yesterday at the CCS premises found several riot police officers manning the company. Some Zambian workers were found waiting to collect their summary dismissal letters while others were reluctant to collect them, claiming that they did not take part in the riot. Those spoken to said they were ignorant about the whole thing and that they were just forced by some of their colleagues to riot. Copperbelt Police commanding officer, Antonneil Mutentwa, revealed that six officials of the National Union of Miners and Allied Workers (NUMAW) and their member were apprehended by police in connection with the riot. Mr Mutentwa said the union officials and their member were apprehended around 17: 45 hours on Tuesday. NUMAW national secretary Albert Mando condemned the action by the workers to riot and damage company property. “We are not in support of what the workers did. We are also disappointed with what happened on Tuesday because the negotiations have not yet collapsed, so why strike or riot?” Mr Mando said. ALL the 500 striking workers at Chambishi Copper Smelter (CCS) were yesterday fired while seven National Union of Miners and Allied Workers (NUMAW) branch officials were arrested and detained on Tuesday evening. The workers were served with letters of summary dismissal by management in the morning. The move by management was as a result of the riotous behaviour by the workers at the company premises on Tuesday morning. Police said those arrested were detained at Kitwe Central Police Station to help with investigations. The workers at the Chinese-owned company had been on strike since Monday, demanding improved conditions of service. The situation worsened on Tuesday when the workers decided to become violent and damaged property worth millions of Kwacha. Both CCS company secretary, Sun Chuanqi and NUMAW national secretary, Albert Mando, confirmed that all the 500 workers who took part in the work stoppage had been served with letters of summary dismissal and had been given three days in which to exculpate themselves. But Mr Mando said it was unfortunate that management had decided to serve the workers with letters of summary dismissal, saying there was no reason to continue with negotiations when its members had been served with letters of dismissal. He, however, said his union would work hard to ensure that the seven branch union officials, who had been arrested, were released so that negotiations could continue. “Yes, I have been told that the management at the company has also served the workers with letters of summary dismissal, but it is unfortunate management has resolved to take this stance. “This decision by management will affect our negotiations because how do we negotiate when our members have been given letters of summary dismissal,” Mr Mando said. And speaking in an interview at CCS, Mr Chuanqi said the management at the company had decided to serve its workers with letters of summary dismissal as a way of disciplining them for their riotous behaviour, but that they were free to exculpate themselves. He said management was eager to listen to the concerns of the workers, but was saddened that the workers quickly resolved to become riotous and damaged property at the company. He said the Chinese investment in Zambia was there to benefit both Zambians and Chinese and there was no reason for Zambian workers to become violent and damage property. “As management, we do not take pleasure in dismissing our employees, but we want them to know that violence does not pay and that they have to do things according to the law. Problems arise where there are people, but things must be done correctly,” Mr Chuanqi said. And Mr Mando confirmed the detention of the seven union branch officials and that he was trying to secure their release. Mr Mando, who was still at the Kitwe Central Police Station by Press time, said those arrested were branch chairman, Oswell Chibale Malume, vice-branch chairman, Christopher Yumba, branch secretary, Steven Kabwe, branch vice-secretary, Christopher Nkandu, treasurer, Kafwaya Ndombwani, vice-treasurer, Chanda Mhango and a shop steward, Kachinga Silungwe. Mr Mando said the seven were picked up on Tuesday evening and had not been formally charged although they were still being interrogated. “Yes I can confirm that seven of NUMAW branch officials at Chambishi Copper Smelter have been arrested and detained at Kitwe central police station. They were picked up around 18:00 hours on Tuesday. “I am actually at the police station, but I have not talked to them because they are still being interrogated and have not been formally charged. As a union, we are trying to secure their release,” Mr Mando said. The Times team which went to CCS found the place deserted with only armed police dotted all over to keep vigil. The head of the UN World Food Programme has warned that the rise in basic food costs could continue until 2010.Josette Sheeran blamed soaring energy and grain prices, the effects of climate change and demand for biofuels. Miss Sheeran has already warned that the WFP is considering plans to ration food aid due to a shortage of funds. Some food prices rose 40% last year, and the WFP fears the world’s poorest will buy less food, less nutritious food or be forced to rely on aid. Speaking after briefing the European Parliament, Miss Sheeran said the agency needed an extra $375m (244m euros; £187m) for food projects this year and $125m (81m euros; £93m) to transport it. She said she saw no quick solution to high food and fuel costs. 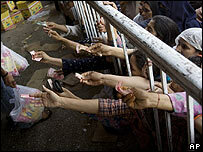 “The assessment is that we are facing high food prices at least for the next couple of years,” she said. Miss Sheeran said global food reserves were at their lowest level in 30 years – with enough to cover the need for emergency deliveries for 53 days, compared with 169 days in 2007. Among the contributing factors to high food prices is biofuel production. Miss Sheeran says demand for crops to produce biofuels is increasing prices for food stuffs such as palm oil. Miss Sheeran said governments needed “to look more carefully at the link between the acceleration in biofuels and food supply and give more thought to it”. The WFP says countries where price rises are expected to have a most direct impact include Zimbabwe, Eritrea, Haiti, Djibouti, the Gambia, Tajikistan, Togo, Chad, Benin, Burma, Cameroon, Niger, Senegal, Yemen and Cuba. Bangladesh: The price of rice has risen 25% to 30% over the last three months. In 2007, the price rose about 70%. El Salvador: Rural communities are buying 50% less food than they did 18 months ago with the same amount of money. This means their nutritional intake, on an already poor diet, is cut by half. Anger over rising food prices have already led to riots in Burkina Faso, Cameroon, Senegal and Morocco. The BBC is planning a special day of coverage of this issue on Tuesday 11 March, online, on radio and on TV. He also suggested that the recent increase in consumer credit is a positive economic development. Well, here are the facts. At the end of November, the latest date for which data is currently available, the most common measure of the money supply, known as M2, had risen 11.4 percent since November 2005 and 16 percent since November 2004. 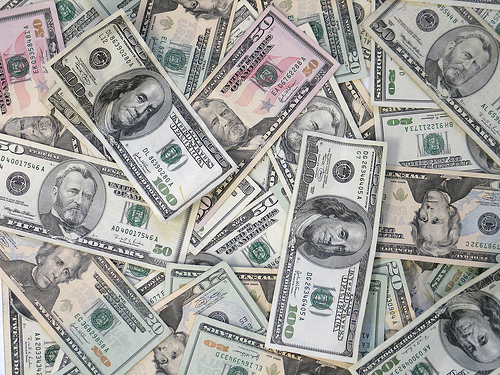 (Just in case you wanted to know: The M2 money stock includes currency, coins and traveler’s checks held by the public; balances in commercial bank checking accounts; balances at credit unions; savings accounts and certificates of deposit accounts less than $100,000; overnight repurchase agreements at commercial banks; and non-institutional money market accounts). A broader measure of the money supply, the MZM money stock, has risen at an even faster rate over the past few years. As of Nov. 30, MZM had risen 18.2 percent since Nov. 30, 2005 and 20.8 percent since Nov. 30, 2004. (In detail, MZM includes all of the components of M2 mentioned before, plus institutional money market accounts and greater-than-one-day repurchase agreements). So, as you can see, the money supply has clearly grown over the past few years. My guess is that the well-respected economist who made the comments about the lack of growth in the money supply was referring to a different measure of money, known as the monetary base. That’s defined as currency in circulation plus funds held by commercial banks at their respective region’s federal reserve bank (“reserves”). Although the monetary base also has risen over the past few years, it has grown at a much slower pace than the M2 or MZM money stock. As of Dec. 31, 2007, the monetary base had risen a modest 4.2 percent since December 2005 and only 8.5 percent since December 2004. The answer is this: When the money supply increases, short-term interest rates tend to decline, and when the money supply decreases, short-term rates tend to rise. In fact, the Federal Reserve adjusts the target rate for the Fed funds rate by affecting the level of the money supply, or more precisely, by affecting the monetary base. When the Fed seeks to lower the target Fed funds rate — the rate at which commercial banks borrow (overnight) from one another — the Fed increases its purchases of U.S. Treasury securities in the open market. Likewise, when the Fed desires a higher Fed funds rate, it sells U.S. Treasury securities. However, the Fed is not able to set the exact level of M2, MZM or other money supplies, because there are other factors that affect the money supply. For example, the ongoing credit crunch and large sums of money that commercial banks have lent to financially-strapped businesses and to individuals over the past six months has caused commercial bank reserves to fall — even though the Federal Reserve has increased its purchases of Treasury securities. As a result of the decline in bank reserves, the monetary base has grown at an anemic rate over the past few months. In fact, the monetary base rose only 1.5 percent during December 2007 from the same period a year ago. In light of the ongoing credit crises, the Fed will likely need to significantly increase its purchases of Treasury securities in order to increase the monetary base. Many Wall Street economists have recently been encouraging the Fed to take this step in an effort to lower short-term interest rates. The result will be that the exchange value of the U.S. dollar will plummet and inflationary pressures will skyrocket. Gold prices, already breaking records, will continue to surge. In regards to the esteemed economist’s comment regarding the supposedly positive increase in consumer credit, you should consider the following: When the economy is in an expansion mode, an increase in consumer credit is usually a positive development, because such a development indicates that consumers are confident in the future direction of the economy. To be more specific, when consumers feel good about their employment prospects and their future earning power (that is, salaries and wages), they tend to take out more loans for automobiles, consumer electronic devices and home appliances. They also tend to use credit card debt more willingly for spending on clothing and other personal items, as well as dining out at their local restaurant. As a result, aggregate consumer spending tends to rise during such periods, as does the total output of goods and services (GDP). That’s because consumer spending accounts for approximately 70 percent of U.S. GDP. However, when consumers become more fearful of losing their jobs and their confidence in future economic conditions falls sharply — which is exactly what has been occurring over the past two months — an increase in consumer credit should be interpreted as a very negative development. This is especially so when a large number of consumers begin using credit card debt to help pay their home mortgage loan, as they have also been doing over the past few months. But, don’t worry, there’s also a way to profit from this type of supposedly “positive” economic development.